I just love the new trend from China “Dog Modding”. Here you can see a nice “Tiger Dog”. The newest thing amongst dog owners in China seems to have emerged from this understandable fantasy and could be described as something like dog-modding: the color-dying of dogs, to make them look like other animals. 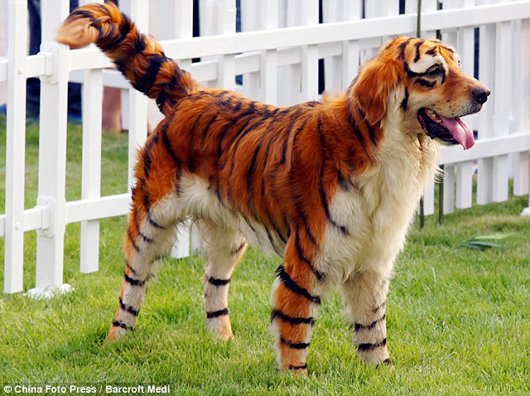 Like this retriever, that is painted like a tiger. Look at this nice Panda Dog. A more convincing example of dog-modding can be found in Wuhan, capital of the Hubei province, central China. A Chinese man modded his dog into a Panda – and did quite well so. As many will know, the Panda is a threatened animal, but also the national symbol of China. All living Panda’s in zoo’s all over the world are gifts from the Chinese government and are also considered state-property of the People’s Republic of China. 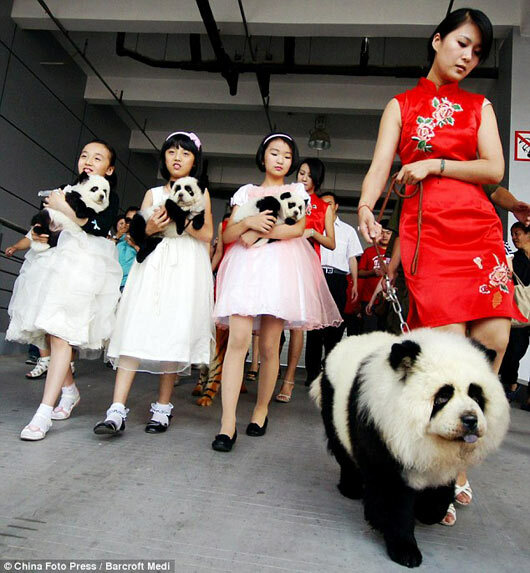 The Panda es extremely popular in China – you could speak of a cult almost. But keeping a panda for yourself, of course, is strictly forbidden. So here the simulation comes in handy. I just read “A better Street View comes form Canada” at ReadWriteWeb and I had to think back to a meeting I had in Shanghai, China, last year with an innovative StartUp. City8 offers a much better quality, zoom function and interaction. The StreetView has been created using high resolution photography. 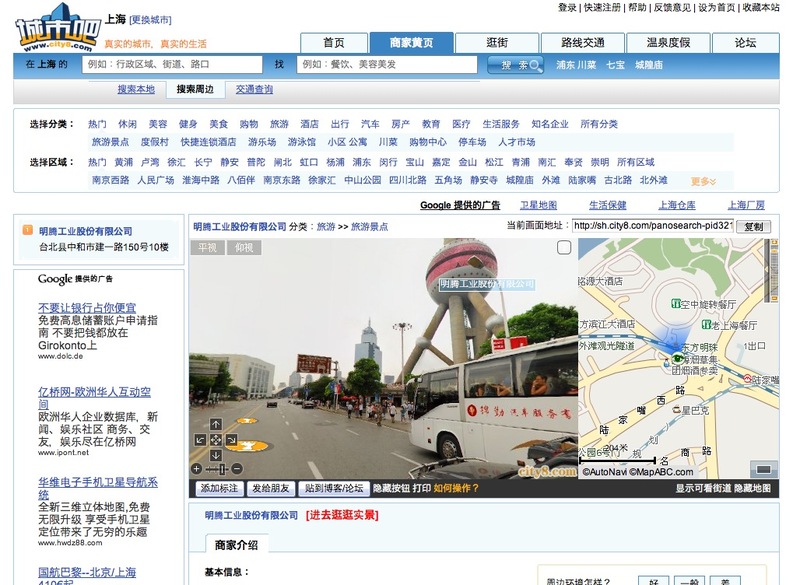 City8 has already digitalized most of the big cities in China and is expanding its service rapidly. The technology and the team surprised right away when we visited them during the Trend Tour for our client. It seems to be even better than the Canadian Street Maps. Left: Picture of a german school-class. Right: Picture of a chinese class during entrance exams. 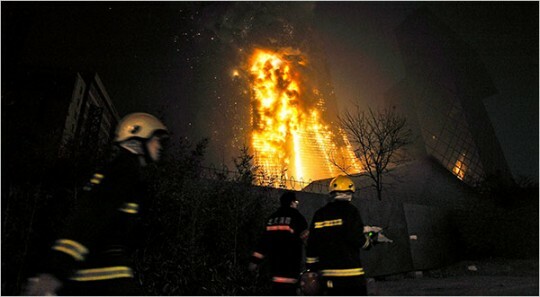 The images by citizen reporters from beijing are damatic. 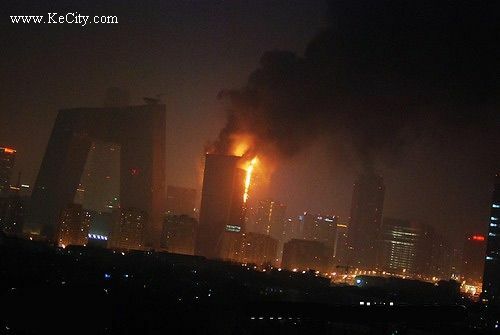 The burning CCTV Skyscraper reminds me of New York’s 9/11. What happened? 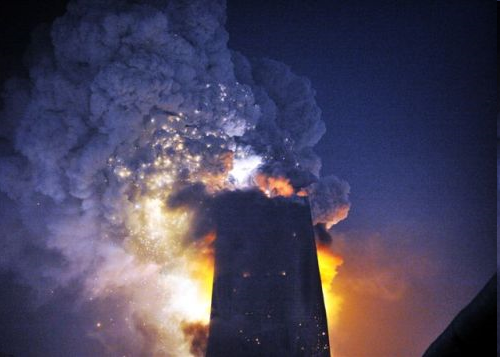 No News on CNN, NBC etc.? “Digital Watch China” and Co-founder of one of China’s most successful rock bands: Tang Dynasty. I talked with him about the future of digital media in China. 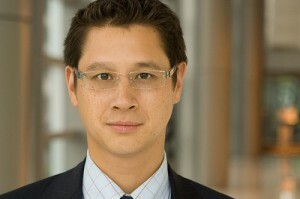 Kaiser explains the big growth in Social Networking and Internet Video in China. Over 77% of chinese Internet Users watch Internet Video which is more than in any other country. Tudou is the second biggest Video Website in China, besides Youtube. 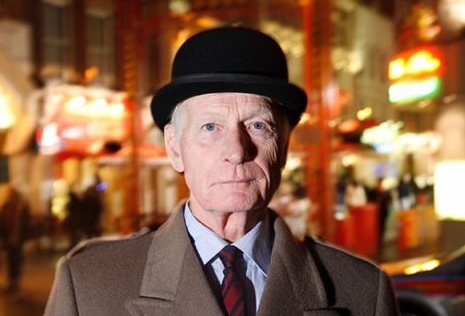 He mentions that it is the first time that Internet Video is taking away big budgets from traditional TV or print media. 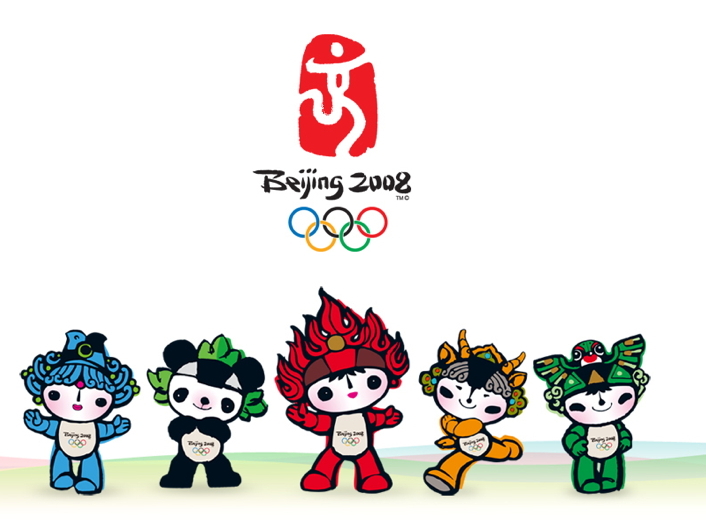 The last hours before the official start of the olympic games in Beijing 2008. The chinese people are getting ready…. TBWA China produced this amazing Spot for Adidas. Tianjin – the next chinese Boomtown? Tianjin can become the third big “boomtown” in China. 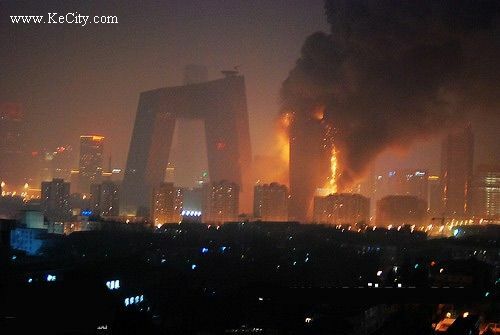 After Beijing and Shanghai the chinese government is now focusing on Tianjin to create a new hotspot in China. Therefore huge development programs have started and the area will see a dramatic change in the next decade. 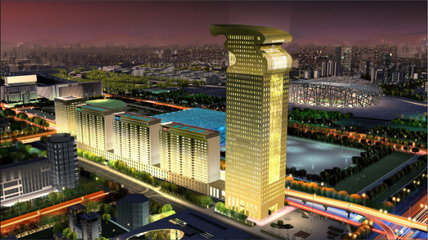 In Tianjin there are already plans to build an impressive skyline and a modern city, comparable to Pudong in Shanghai. The Word Economic Forum is organizing the next “Annual Meeting of the New Champions 2008” to be hold in September 2008 in Tianjin. 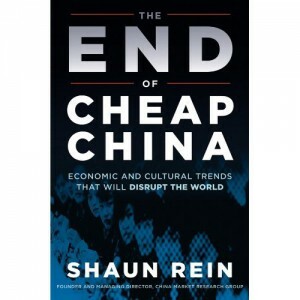 China is growing rapidly and expands its influence on a global level. One dramatic side effect is that 16 out of 20 dirties cities, on the World Bank’s list of most polluted cities, are in China. 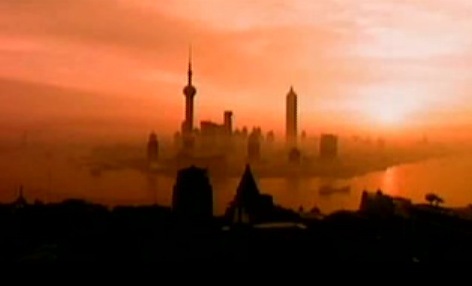 There is a dramatic water shortage in 400 of 668 China’s biggest cities. Environment, water and air pollution are important issues for the future of China. That’s why China is pushing sustainable concepts and projects. The Green Dragon Media Project is documenting this tough challenge and shows major steps into a greener future for the 1.3 billion inhabitants in China. In Munich there is a big discussion these days about the Maglev-Train from the airport to Munich-Downtown. I don’t understand the issue. It is a german technology and the train is much more cost- and energy efficient than any other train. The german ICE is much more expensive due to the high repair and maintenance cost, but the big cooperations want to make money and do not want to kill their own money machine. Due to the lack of physical contact between the track and the vehicle, there is no rolling friction, leaving only air resistance. 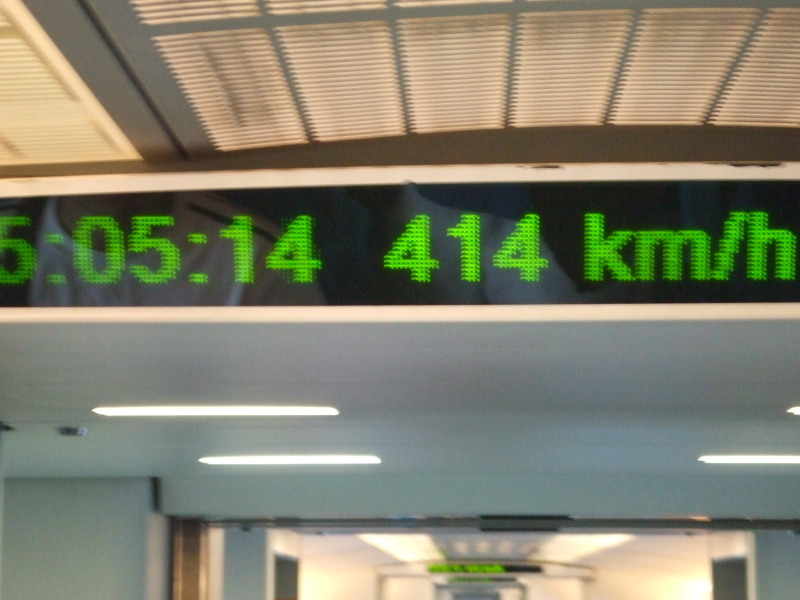 The Transrapid technology is already many years old and it the best example how slow Germany can be. So don’t discuss about it – we want the Transrapid! 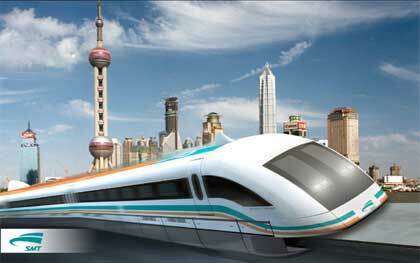 The Shanghai maglev cost 9.93 billion yuan (US$1.2 billion) to build. This total includes infrastructure capital costs such as manufacturing and construction facilities, and operational training. While high-speed maglevs are expensive to build, they are less expensive to operate and maintain than traditional high-speed trains, planes or intercity buses. Here is a Video I produced during my last trip to Beijing. I now found some time to cut the whole Video and put it online. At the Urban Planning Museum of Beijing you can see some futurist buildings (which are still in construction) and get a great overview of the city. After an inspiring travel to China and Thailand we arrived back in Munich yesterday evening. 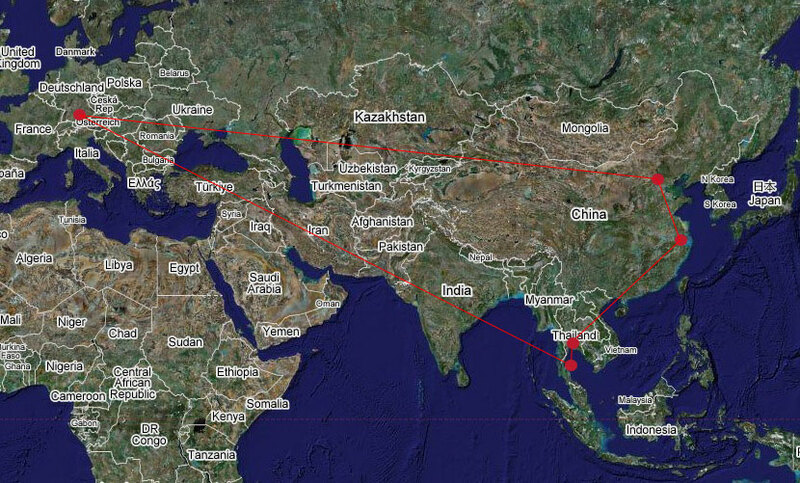 Here you can see an overview of my journey of the last weeks. The main time we spent in Beijing to work at the CScout office. At Shanghai I met many interesting people including Birgitte Wolff of China.de. On the way back we spent a few days in Bangkok and Koh Samui to reflect the strategy for CScout’s China Expansion. During my stay in Beijing I met Andreas Weigend who is Professor at the Tsinghua University in Beijing for the Executive MBA Program. He organized a great “Foot Massage” next to his Hotel so we could relax and talk about Business opportunities. Our discussion has been on current projects but also on the development of the chinese market. His newest project is called “imagelooop” – he is supporting the german startup during the expansion period. Andreas, thanks for your time and hope to see you soon again.